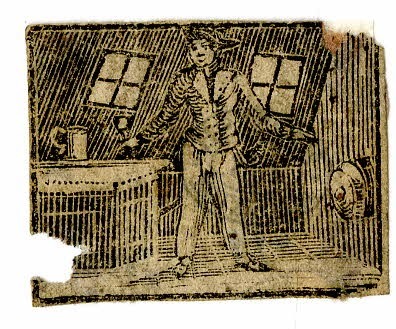 "S (Sailor)," Thomas Bewick, 1781, British Museum. Taken from the book Reading Made Very Easy and Diverting, this illustration of a sailor represents the letter "s." Given that this book is intended to get the concept across as quickly and easily as possible to the reader, we can take this image as an effort to capture the stereotypical appearance of sailors. He wears a cocked hat witht he point forward, a double breasted jacket without cuffs that ends at the waist, long and close fitting trousers made with a broad fall fly, and a sword at his waist. And what sailor would be complete without a rather large tankard or a glass in his hand? To the right of the sailor is what appears (at first glance) to be a keg or barrel. According to the curators of the British Museum that is intended to be the rear of a cannon.